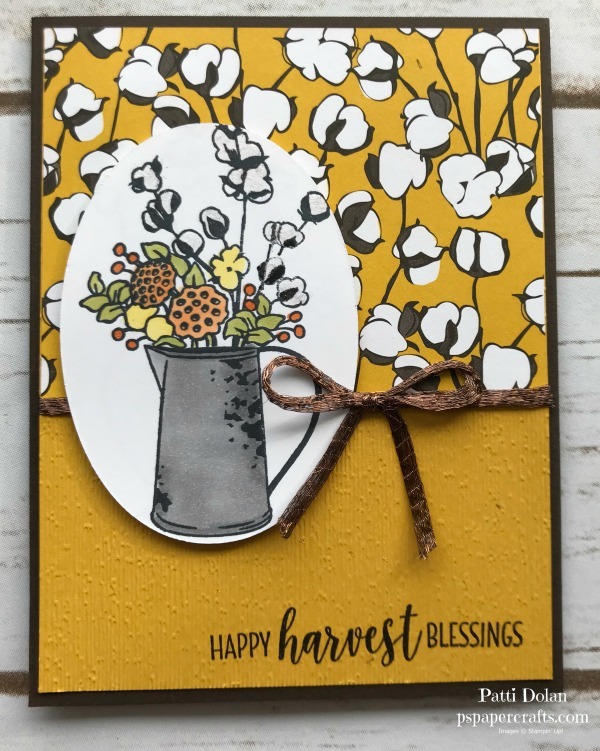 The Country Home Stamp Set coordinates so well with the Country Lane Designer Series Paper and then layered on the Subtle Embossing Folder…what a combo!!! Stamp the pitcher and flowers on the Oval in Tuxedo Black Memento Ink. Color with Stampin’ Blends. Be sure that you have a piece of scrap under the oval since the blends will bleed through the back a little bit. Add some Wink Of Stella to the cotton flowers to give them some shine. I don’t think you can see it here in the picture but it really does look beautiful and shimmery in person. Stamp the sentiment in Early Espresso at the bottom of the Crushed Curry layer. Here’s a peek at the inside. I was going to color the flowers but I actually like them just left in black.